When you book your after dinner entertainer here is some useful information on how to promote a show. Posters will be sent out to help to promote most public engagements, larger quantities can be made available upon request or you can download an image below. Please right click the image, select ?save picture as? save it to somewhere on your computer, then you can open it up and print it ?as is? or open it in an editing programme and add your own text. 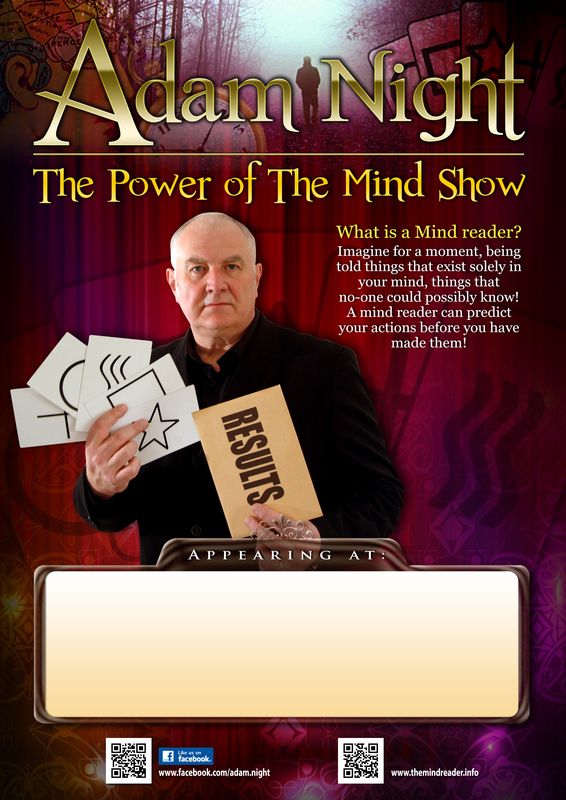 Promotion is King to having a great mentalism show. Everything you can do to get more people through the door is good for both you and the mentalist. Spread the word where ever possible. Consider leaflets in prominent positions or delivered door to door. A good source for cheap printing (even FREE!) also useful for making your own tickets is www.vistaprint.co.uk . Websites ? put the event on your website or if you don?t have one, get one! Adverts in local shops, like newsagents, are usually very cheap and get lots of local passing trade. Newspapers ? most have a what?s on section and are reasonable to take paid adverts in, but plan ahead. If this is a fundraising event for a charity or organisation, Gather a committee, or have the entire membership sell tickets to their friends, family, co-workers, neighbours etc. This way there will be little or no advertising costs! Use your current show to market your next show ? plan in advance and if you have people in who are having fun, tell them about what is coming up soon, give them leaflets, even try and sell tickets there and then whilst they are in the right mood.